Some admissions committees have said that the letters of recommendation comprise the single most important aspect of your MBA application. Carefully managing the recommendation process, from selecting the right recommenders to ensuring effective content, is essential. Learn how to elicit the strongest and most compelling responses from those who write on your behalf. 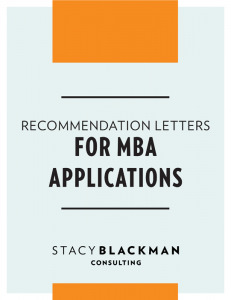 The Stacy Blackman Consulting recommendation guide includes sample templates that can be utilized for preparing your recommender, tips to help select a recommender under any circumstance, as well as eight sample recommendations, covering many different scenarios. Format: 33 page PDF download.